Pizza is something which everyone likes to gorge on. 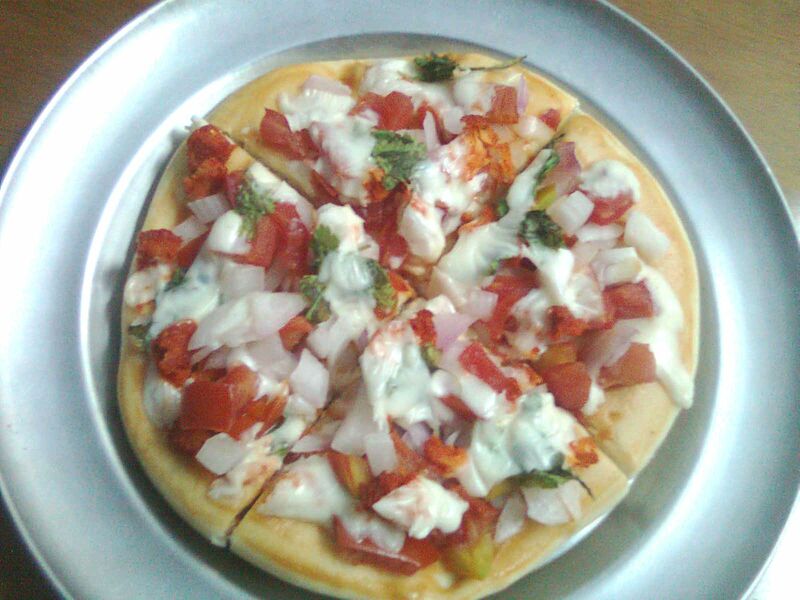 Covered with veggies, herbs and a whole lot of other toppings it is a must have for many. I have given below a basic and quick pizza recipe with ingredients that are present in every home. You can also add toppings like cooked mushrooms and other vegetables. Take a pizza base, place it in the oven and cook for a few minutes till it is slightly brown on both sides. Remove from oven, allow it to cool down and cover the upper surface with tomato ketchup, then arrange chopped onions, tomatoes and capsicums over it. (I have also added chopped chicken kababs just to add an extra taste. You can omit this step and can add mushrooms or any other veggies but they have to be cooked before they can be added over the pizza base). Garnish with coriander leaves and sprinkle salt and pepper over it(optional). Then top the pizza with grated cheese and place in an oven which has been preheated for at least 10 minutes. Bake at 150 degrees celsius for 5 to 10 minutes or until the cheese melts completely. If you are making this for the first time, keep a close watch over it to prevent burning. Cut into slices and serve.